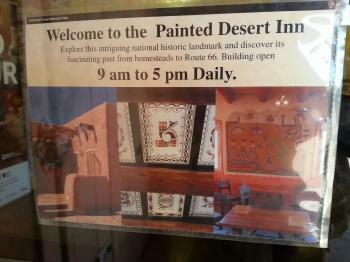 Painted Desert Inn: Explore this intriguing national historic Landmark and discover its fascinating past from homesteads to Route 66! 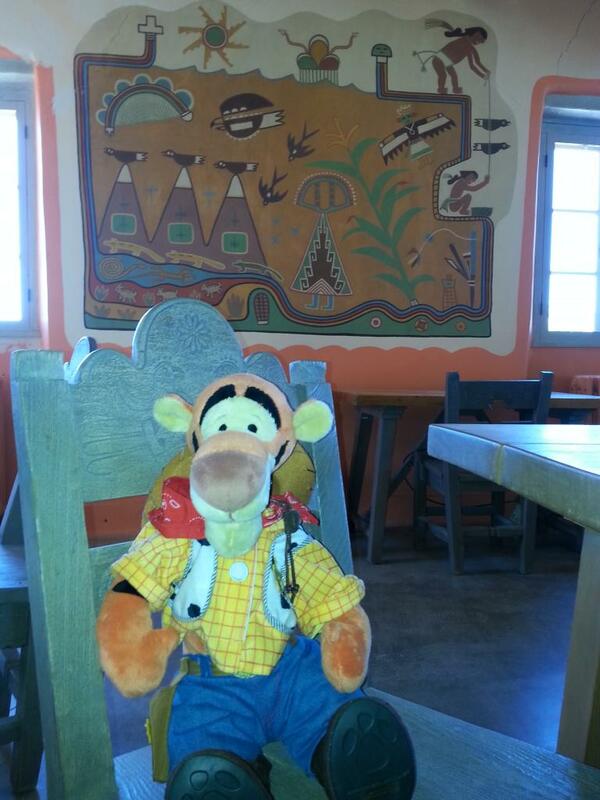 It is in the middle of the Painted Desert right on I-40! Tigger Travels - Family Adventure Journal Photos From Tigger`s Travels and MORE! Explore this intriguing national historic Landmark and discover its fascinating past from homesteads to Route 66! 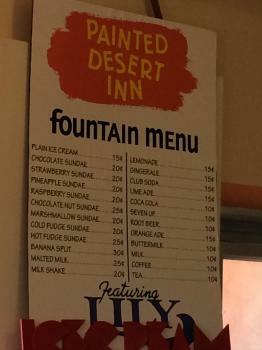 It is in the middle of the Painted Desert right on I-40! On your next drive to (or across) Arizona from the east, you are sure to pass the exit to the Painted Desert. The drive itself is one of the greatest displays of the beauty that can only be found in the desert southwest. Enormous vistas full of surprising color and drama created by millennia of erosion digging deep in the earth's layers. 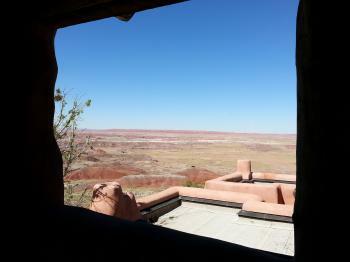 In the midst of the scenic drive don't pass up the Painted Desert Inn. 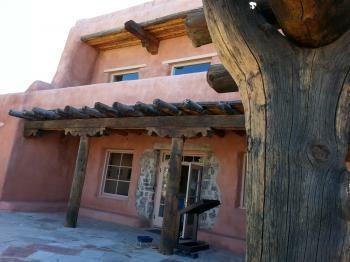 The current adobe facade dates back to the mid 1930s but stop in for a stroll to see images of how it looked when it was originally built in the early 1920s of petrified wood! 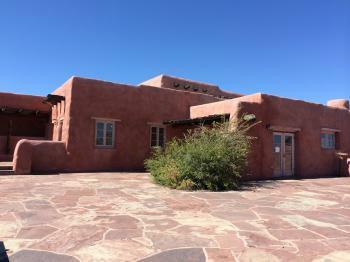 Inside (from 9 am to 5 pm daily) you will find numerous exhibits illustrating the building of the inn, the customs of the indigenous tribes, more views of the Painted Desert and more. 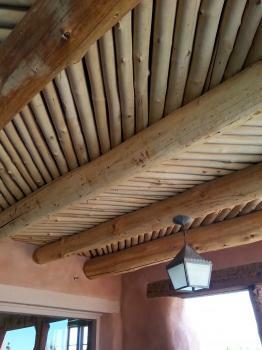 It is not a huge building, but every room has something of interest. The Inn is situated on two floors. 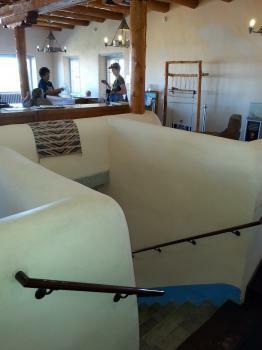 The original staircase is obviously not friendly to wheelchair access but the lower floor is easy accessed via paths down the east side of the building (the right side) all the way down to Kachina Point beyond the Inn. Whether your interested in the design of the building, the history behind it or just a moment to sit at the historic Fountain bar (not serving, just a display of how it looked in its heyday) there is something for everyone. View of east entrance on lower floor. 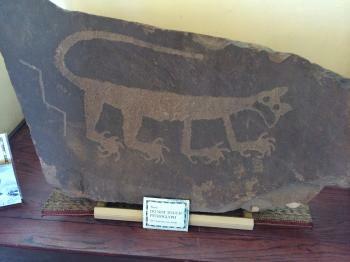 A beautiful example of the many Petraglyphs found in the area. 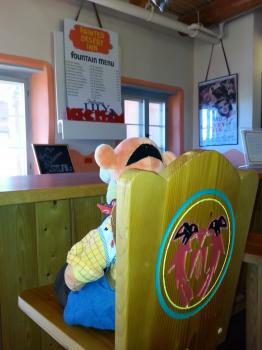 Tigger looking for a fountain drink.